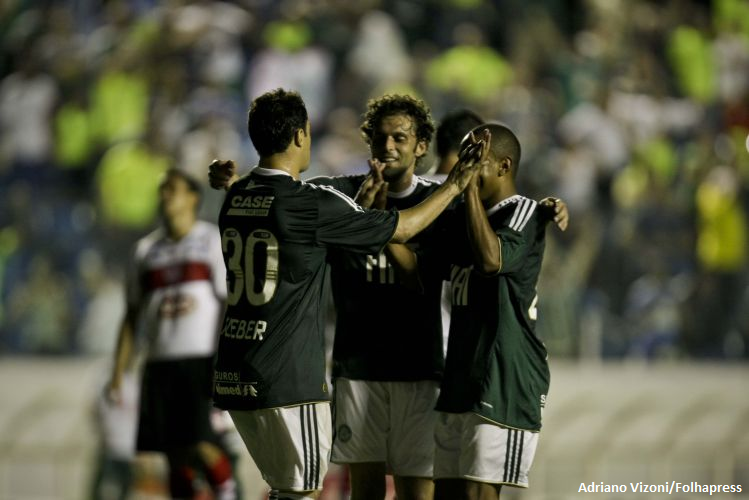 It would have been difficult to foresee a happier reunion between Lincoln, Palmeiras and the supporters. Early into the game against the rather weak and defensive-minded Linense, Scolari made minor adjustments to tactics and positioning; within 30 minutes, Palmeiras was completely dominating the scene. Lincoln was the general of the field, objectively distributing and carrying the play forward. With his truly great ability to receive the ball and turn/advance in a single flowing movement, the absence of Valdivia was rarely felt yesterday. Other players stood out as well, players we’ve come to expect less of. Rivaldo, on his usual position on the left flank, possibly played his best game ever in the Palmeiras jersey (althought that doesn’t necessarily mean much). Patrik – rather invisible lately – scored twice and seem to be getting his confidence back. Both Marcio Araujo and Leandro Amaro fulfilled their tactical obligations well. Adriano darted back and forth. Cicinho again showed great offensive qualities on his right flank. Kleber fought hard as always and converted a penalty into 2-0. Below, highlights for your viewing pleasure. It’s been a full three months since we last saw Lincoln on the pitch. The reason for this is unclear, as he’s been recovered from injury for quite some time. The pigheaded decision to keep him out of the squad might be related to his recurrent demands for payment of the money Palmeiras owes him (when arriving from Galatasaray, Lincoln paid part of the transfer sum from his own pocket, still awaiting the complete reimbursement from Palmeiras), striking a bad chord with the directors of Palmeiras and/or with Scolari himself. Perhaps the fact that Lincoln not always seems satisfied with standing in the shadow of Valdivia is a piece of the puzzle. Perhaps he’s a bit of a “chinelinho” (flip flop), preferring to take it easy in the medical department when possible. Perhaps he’s been caught eating his own boogers. Perhaps all of the above, perhaps none. Whatever the reason, the situation must come to a conclusion (and perhaps it has?). Palmeiras obviously benefit from having him in the starting eleven or as a substitute for Valdivia. Also, let’s not forget that Lincoln’s salary is amongst the highest in the squad. Needless to say, he needs to be put into good use. With four rounds to go before the knockout stage begins, Palmeiras rests in second place, one point behind Corinthians. On Saturday, the Verdão take on Bragantino. Valdivia is still recovering from muscle strains, while Assunção received his third yellow card yesterday. Against a stronger opponent than Linense, time is ripe for Lincoln to convince us all that he’s back to stay. The explanation of Lincoln hadn’t been playing was the policy of new president. Lincoln has a expensive salary and was staying too much in the medical departament. Even so, I think if Palmeiras wants to sell him we should put him inside the field to play to capture the atention of others teams because he is a good player. I agree with you. I hope Lincoln remains in the team. But if the policy is to sell him, he nedds to be seen. The pitch is his “vitrine”, that’s where he will draw the attention of other clubs/managers. But again: I hope he stays. Palmeiras is way to dependent on Valdivia.